Following World War I and the dissolution of the Ottoman Empire, the UK received a mandate to govern much of the Middle East. Britain separated out a semi-autonomous region of Transjordan from Palestine in the early 1920s, and the area gained its independence in 1946; it adopted the name of Jordan in 1950. The country's long-time ruler was King HUSSEIN (1953-99). A pragmatic leader, he successfully navigated competing pressures from the major powers (US, USSR, and UK), various Arab states, Israel, and a large internal Palestinian population, despite several wars and coup attempts. In 1989 he reinstituted parliamentary elections and gradual political liberalization; in 1994 he signed a peace treaty with Israel. King ABDALLAH II, the son of King HUSSEIN, assumed the throne following his father's death in February 1999. Since then, he has consolidated his power and undertaken an aggressive economic reform program. Jordan acceded to the World Trade Organization in 2000, and began to participate in the European Free Trade Association in 2001. After a two-year delay, parliamentary and municipal elections took place in the summer of 2003. The prime minister appointed in November 2005 stated the government would focus on political reforms, improving conditions for the poor, and fighting corruption. 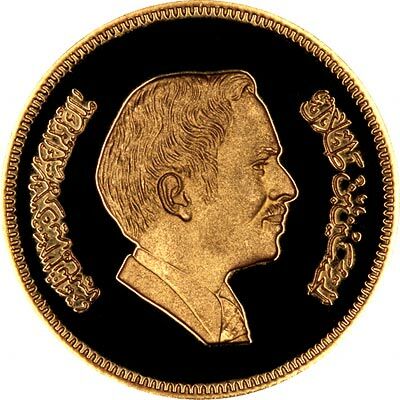 Jordan issued its first gold coins in 1969. They are demoninated in dinars, and are exclusively proofs or commemoratives. 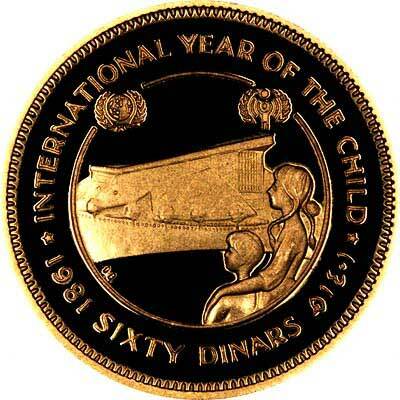 We show a 1981 proof issued as part of an international 12 coin UNICEF set. The obverse showsKing Hussein, and the reverse shows the Palace of Culture in Amman. For silver and base metal coins of Jordan, please look at our original Chard Coins website.